This article was originally written as a handout for those wishing to understand more of the details of the Memento Mori in Medieval Europe. In the Middle Ages, the large number of deaths caused by the Black Death (Bubonic Plague) and wars inspired a Cult of Death that was often visible in jewelry and art work. This art almost always includes a skull, a skeleton, or a coffin. Tombstones often included a skull or sometimes a complete skeleton. This was supposed to remind friends and family members that they would die someday, too, and should therefore live their lives in a fashion that was good for their souls. Virtuous living would ensure a place in heaven instead of an eternity in hell. Another interesting manifestation of the Memento Mori is the use of natural materials to represent blood. For instance, heliotrope cameos have naturally occurring red flecks in the stone. These flecks were used to represent blood in images of Christ with a crown of thorns. This material became very popular with Italian Renaissance cameo carvers. Commonly used pieces of jewelry, such as Rosaries, rings, and pendants are among the types of jewelry found in Memento Mori. The pendants were usually worn on long chains, but they could also be pinned to a lady’s bodice or sleeve. Men also wore pendants pinned to their clothing or their hats. One of the most famous pieces of this type of jewelry is the Tor Abbey Jewel from England. This pendant includes a complete enameled gold skeleton in an enameled coffin. 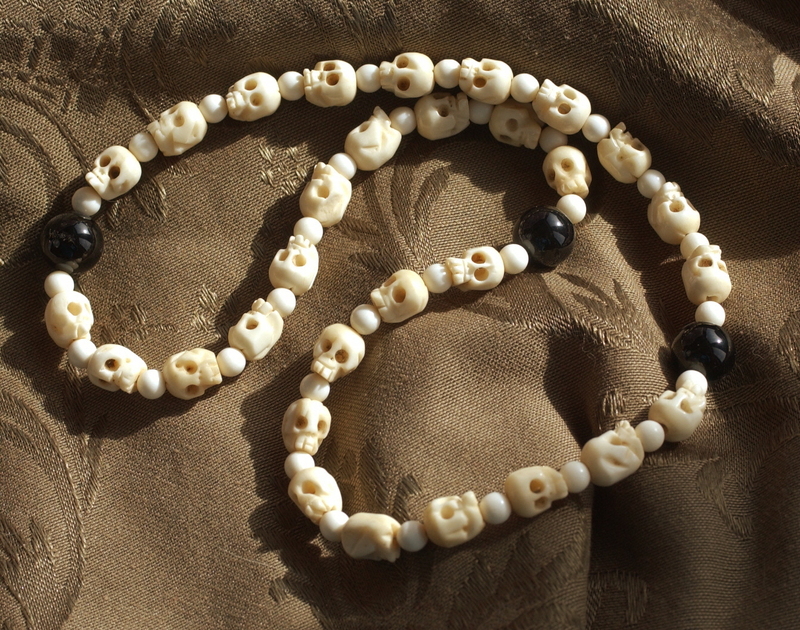 Rosaries using skulls as “counters” – either “Aves” or “Our Fathers”, or having a single skull as a pendant were also popular. Some elaborately carved wooden Rosaries included entire scenes in their “Our Fathers”. These scenes were hidden inside “beads” which could be opened to reveal the scene within. Here are a couple of examples of Memento Mori style Rosaries. 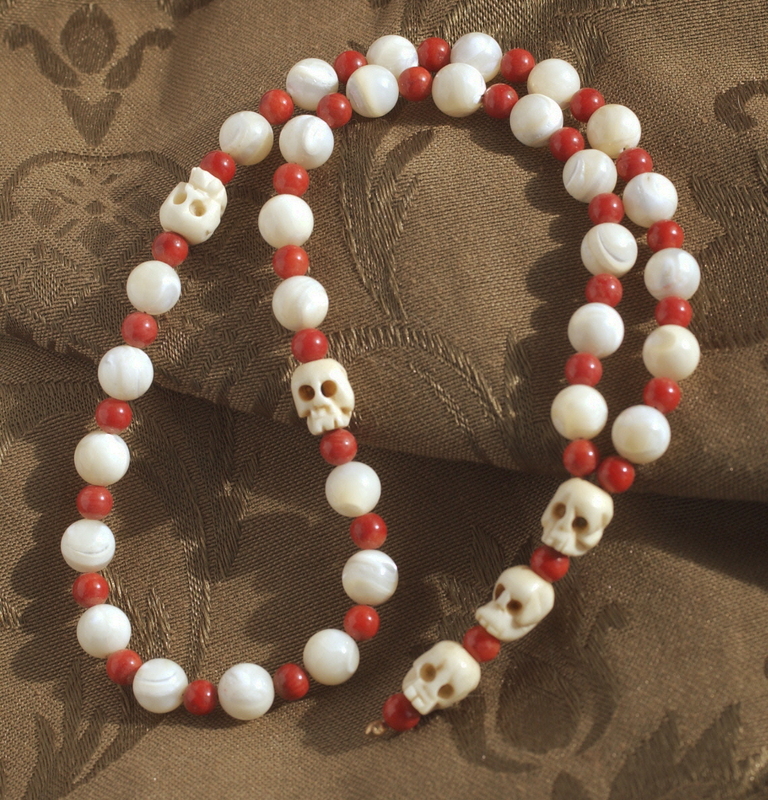 First we have a three decade Mother of Pearl and Coral Rosary with white bone skulls. This three decade Rosary uses white bone skulls for the Aves and Black Onyx Beads for the Our Fathers. Funeral or Mourning Jewelry is sometimes included in the concept of Memento Mori, but this jewelry is usually focused on a particular individual. This form of jewelry became particularly popular in the late 1700’s. A lock of the dead individual’s hair was sometimes included in the jewelry. During later periods, most notably the Victorian Age, hair jewelry became an important art form of its own.